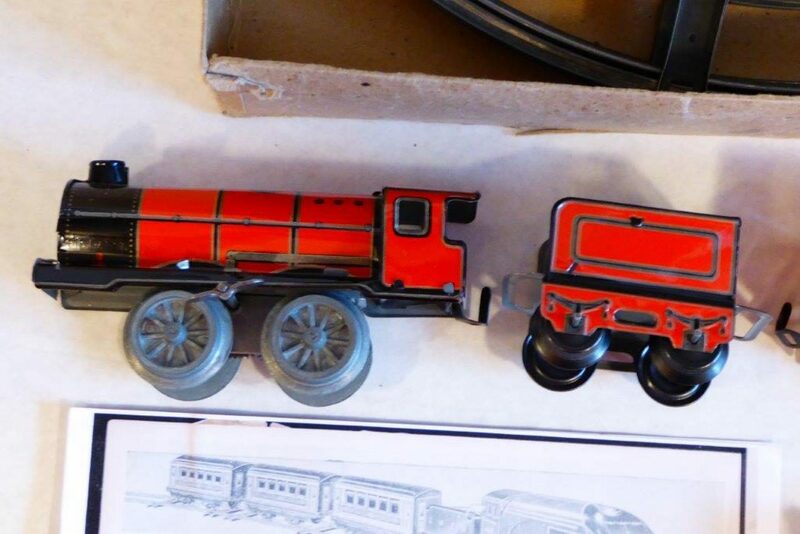 Could this clockwork O gauge British train have been sold at Eaton’s in 1948 – 1949? 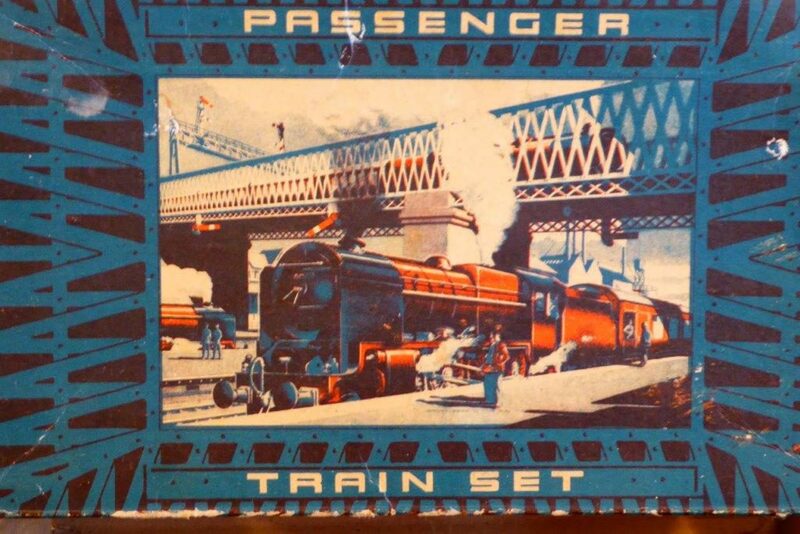 Tinplate fan Charles Hare from San Antonio shared this with us. 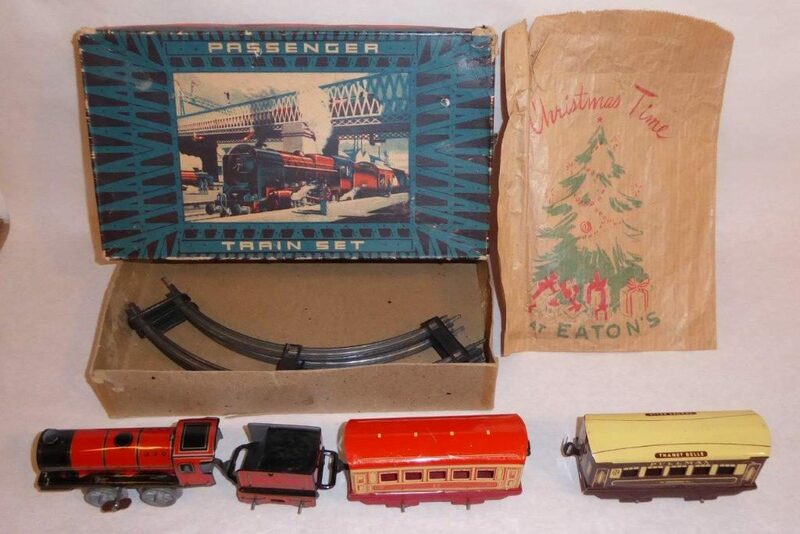 A British clockwork ‘Mettoy’ tinplate set purchased at Hudsons in Denver, looks pretty identical to pieces in the 1948-49 Eaton’s Winter Catalog that were’ made in England’. Hmmm . . .anybody in Canada have something similar ? If so, please add your comments below! This tiny loco had cast metal drivers, no rods, and (fortunately) a harder-to-lose integral key. Both the tender and carriage had blackened tinplate wheels, tending to push the train’s estimated date a bit earlier than if it had plastic wheels. Each driver wheel had a raised letter “M” and smaller numeral 2 or 3 on its inside surface. Its box also contained a circle of unexpectedly sturdy 2-rail O-gauge track and a paper sack, and the descriptions “Passenger Train Set” and “Train Set No. 5341” were included in the box printing. Data like price or a store label, often used to help with provenance, were not present. A web search for the set number alone didn’t turn up a match. Those of you more informed about your beautiful country and its toy train history can see where this is going. 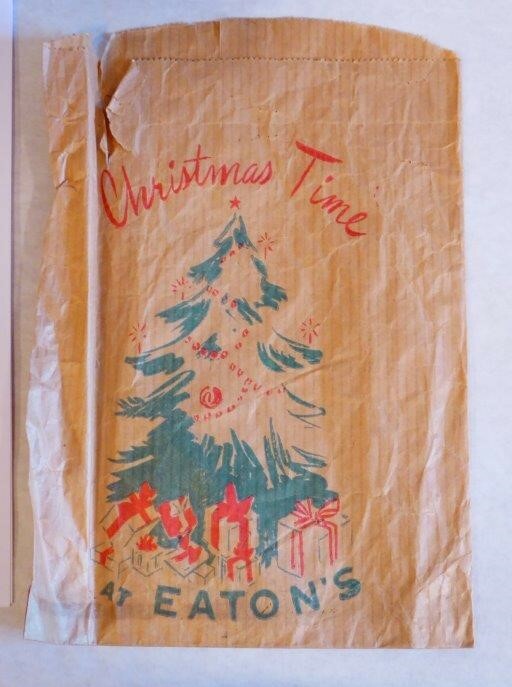 When I looked up Eaton’s, the web returned all kinds of information about this store. It must have been a wonderland for kids at Christmastime, including an overhead monorail people could ride in! Paging through the available catalog files, I did not find an exact match for the set I have. 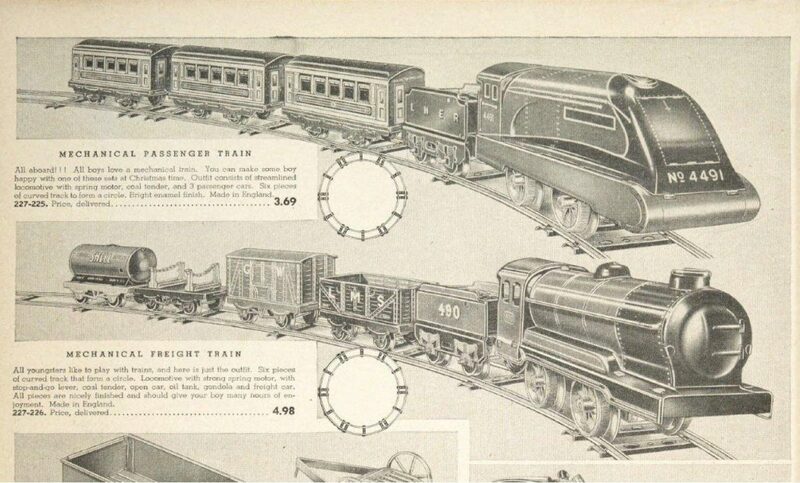 However, page 512 of the 1948 – 1949 Winter catalog shows a set including 3 carriages too similar to my single carriage to be a coincidence. Limitations of file and copy resolution, as well as absence of color or manufacturer in the catalog, prevented me from certainty about the origin or retailer of the set. Finally, thread 3 began when I was lucky enough to acquire some additional British sets from TCS (British Train Collectors Society) friends during our visit to the British Isles in 2015. Marcia, my very indulgent spouse, and I attended a toy show in the Midlands and a TCS show in Biggleswade, and toured the Toy and Train Museum in Brighton as anchor points in our all-rail 3-week journey. 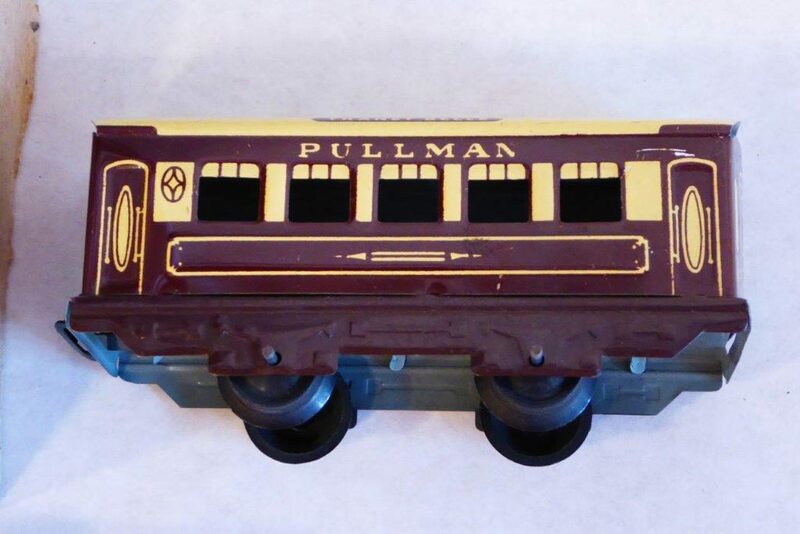 One set kindly offered was a late boxed Mettoy “Safetylectric” passenger set with two “chocolate and cream” 4-wheel carriages having their metal stamping and punching identical to the carriage purchased in Denver, and suspected to be from Eaton’s. So this is what it took to identify the set with reasonable certainty as Mettoy. If Mike Foster has room for Mettoy in Book 4 of (“those other”) British Toy Trains, anticipated later this year, we will all know everything important about this company and its trains. Here’s hoping that this little account of toy train historical research helps you recall similar tales of your own, or inspires the search for knowledge of toy trains to be shared with other enthusiasts. 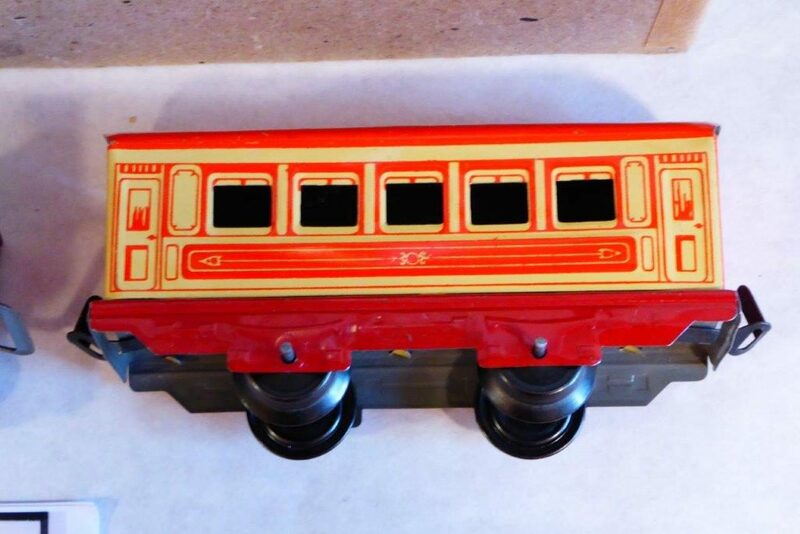 There are many examples of basic toy train sets that are colorful and ingenious. Such sets are a focus of my collection because almost every one has a story, and they are just so fun to look at and compare. Other manufacturers that I know firsthand sold 3-piece sets include Betal, Bing, Brimtoy, Chad Valley, Charles Rossignol, Fischer, Hafner, Husch, JeP, and Paya. You probably know of others, and I would love to hear your stories about them.